The main garage in Lowell has to be replaced due to age. It is going to cause a major parking shortage. This is an opportunity to run North of Lowell to get an idea what sort of ridership could be developed. A temporary platform could be constructed on the MA side of the Pheasant Lane Mall where there is a large unused parking lot. Simon the owner of the parking lot could rope off a section and charge for parking(they can keep the revenue from that to get them to go along with this). A few weekday trains can be extended to operate to/from here. No special track upgrades have to be done, the trains can operate slow(like the Cape Flyer). How are the current speeds on the NH Main from Lowell to Nashua? That still doable at close to 60 MPH? They would probably need to go all the way to downtown Nashua and borrow some idling room in the PAR yard as a makeshift layover, even if the last stop is at the state line. I doubt the current deadhead-to-BET situation at layover-less Lowell is going to cut it with the makeshift extra running miles unless they can get some temp storage space between Bleachery and Nashua Yard. They may also have to front-load the presently unfunded relocation/consolidation of the Bleachery Jct. switches to make this happen. And since that reconfig is dependent on PAR emptying out more Lowell ops to Lawrence and running more freights nonstop from Ayer to Lawrence, that will also require them hurrying up and finishing the neverending Haverhill upgrades from Lowell Jct. north. No, you are making this way more complicated than it's necessary. First the speeds will be around 30 MPH. One temp mini high platform will be constructed at the mall. Since the morning rush hour trains deadhead out to Lowell you can pick two to leave Boston early and deadhead up to the mall. They will leave early enough from the mall to make it's normal schedule out of Lowell. As for the evening rush hour, there is one train that deadheads back. That could be the one that goes up the mall. That's the easiest way to do this. The other option is make a shuttle train of two or three cars to operate on a schedule to meet the regularly scheduled trains at Lowell. That would work perfect on the weekends. My simple reply: nothing ventured, nothing gained. Possible obstacle: getting PAR to get onboard with the idea; also, 30 MPH is quite slow to be attractive, but: who knows? If not Nashua, is there a place in North Chelmsford that the idea could happen? PAR might be more inclined to go along, given that it's 2 MT until the wye. It's a parking crunch, and I am not sure there is a place ready to go now(with not a lot of cost to construct) between Lowell and the mall. As far as PAR goes, the MBTA signed a deal giving the T rights to operate on any of their trackage providing they pay to or maintain the tracks. This all came out of the Fitchburg to Wachusett deal and has been used to move equipment via the Worcester Line during the Grand Jct outage. Having double track from Lowell to the North Chelmsford wye definitely helps. The trains will not stay long on the Northern Main, so it shouldn't effect coal trains or locals in the Nashua area. That parking lot that is 'unused' on the Tyngsboro side of the mall is the employee parking lot during the Christmas rush so that the employees don't have to go to another time zone to park (Pheasant Lane DOES entirely fill up for a month). That's why there's a fence around it. I think Billerica and Anderson are about to get a whole lot busier. Anderson has a lot of unused space. No one is going to drive that far north to get on a train to go south. I know I wouldn't. The MBTA owns the trackage from Lowell to the NH State Line. newpylong wrote: I think Billerica and Anderson are about to get a whole lot busier. Anderson has a lot of unused space. No one is going to drive that far north to get on a train to go south. I know I wouldn't. It's not getting people to drive north, it's the people that come from the north. A majority of plates in the garage in Lowell are NH plates. edbear wrote: The MBTA owns the trackage from Lowell to the NH State Line. They don't, however, dispatch it. As mentioned above, the MBTA has rights anywhere on Pan Am. 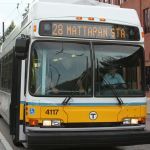 Even though the proposed idea is fully on MBTA own rails. it, so they kept it.